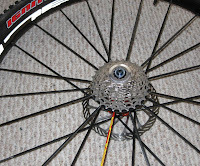 Found out the SRAM FORCE 10-spd rear derailleur didn't work with the SRAM XO 9-spd shifter (they both claim to be 1:1). I wasn't happy with the SRAM 970 9-spd road cassette either, so I went out again to source some more good parts. The project is slowly moving ahead. In picture: a beautiful Dura Ace 12-27t 9spd cassette on a CrossMax SLR.